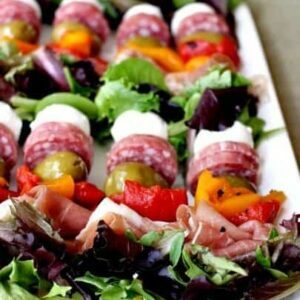 These Antipasto Salad Kabobs are a perfect appetizer to serve to a crowd because there’s something for everyone. No having to worry about who likes what…there’s usually something that everyone likes on an antipasto platter. I have to say, I’m not a big salad guy at all. I eat plenty of other vegetables, just not in salad form. But I do love an antipasto salad…minus the salad part. Then I thought about combining antipasto and salad together and putting it on a stick to make it more fun to eat. These kabobs would be an interesting way to serve an antipasto platter at your next party or BBQ, you’re guests would be way more impressed than a bowl of salad thrown on the table. All you have to do is grab your favorite meats and cheeses and whatever other antipasto ingredients you like, olives, roasted red peppers…whatever you can think of. Then I just threaded them on a wooden skewer and put some (some) lettuce leaves on there too. It’s not a LOT of salad, but it counts right? You could drizzle these Antipasto Salad Kabobs with your favorite vinaigrette, or put out a couple of different dressing for dipping. 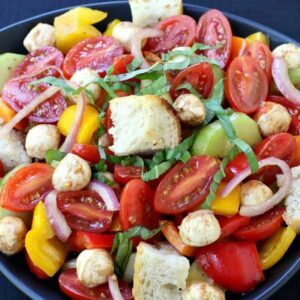 The kids liked dipping each piece into their favorite dressing and eating it off the stick, but we took our antipasto salad off the kabobs and tossed them in a bowl with some balsamic vinaigrette. Add some bread and these kabobs are almost a full meal. 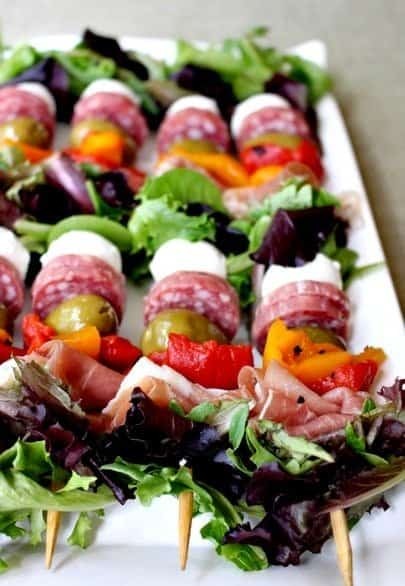 The ratio of these Antipasto Salad Kabobs is perfect for me…lots of meat and cheese and just a little bit of lettuce. Hey, you’ve got to start somewhere! You can customize these kabobs any way you’d like. You could use turkey and ham, chunks of parmesan or cheddar. Thank you! I actually just bought them that way, I found them right at the grocery store! Before I found them I was going to do thin slices from the deli, folded then skewered. Either way would be great! Needed something special to add to Christmas dinner in honor of my Italian father who’ll we’ll dearly miss this year. THANK U Can’t wait to make them. Your welcome, they are so easy to put together and they look great on a holiday table. Salute to your father, I’m sure he’s missed. Have a great Christmas! I will definitely include this on the menu for a surprise party scheduled for March. Thank you for sharing. That sounds great, Tonya – Thanks for stopping by! This is such a gorgeous way to eat healthier… love it! Salad on a stick? I’m SO all over this for my next party. Right? Everything tastes better on a stick- even salad! This is the best idea I’ve seen in a long time!! Love it!!! I want to serve this at every one of my get togethers, they are so cute! And my kind of food, that’s for sure! Thanks Aggie, anything to get me to eat more salad is good! These are so fun! Perfect for the holidays! What a brilliant idea ! On repeat this goes for sure! Thank you so much! I’ll click over myself and check it out! Wow Mother’s Day and my mom wants everyone to bring a salad and I dont like salad so this is an easy alternative because I can eat everything else other than the greens. Can these be made the night before? Unsure if lettuce would hold up nicely. You’re right Amye, the lettuce won’t really hold up well, especially when it’s put next to the other ingredients. The great part about this recipe though is that it’s fast to put together! Pingback : Hitting a BBQ today? 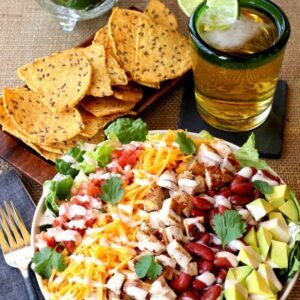 Here’s Pinterest’s top ten most-pinned Labor Day recipes - How to do everything! 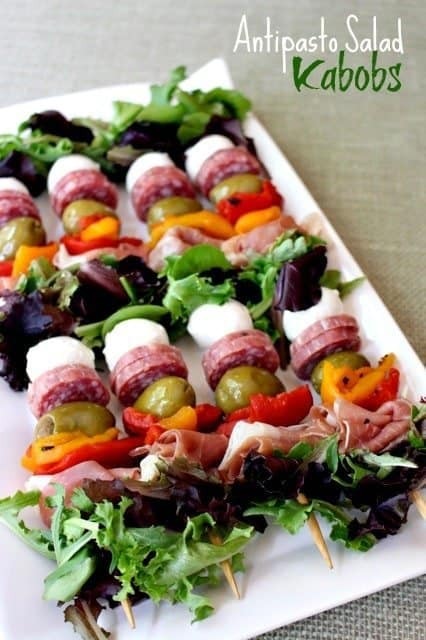 I love this antipasto salad kabobs! They looked so nice and delicious! This just looks so colorful and delicious! Will some of these for family dinner! Our younger son LOVES salad, he eats it almost every night so when we make these it’s the best night ever for him! Looks mouth watering. 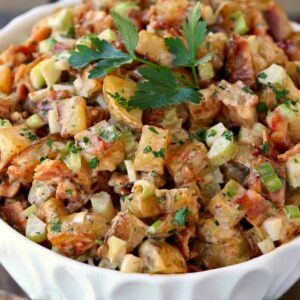 I love salads so this one is a big hit for me. Thanks for sharing!